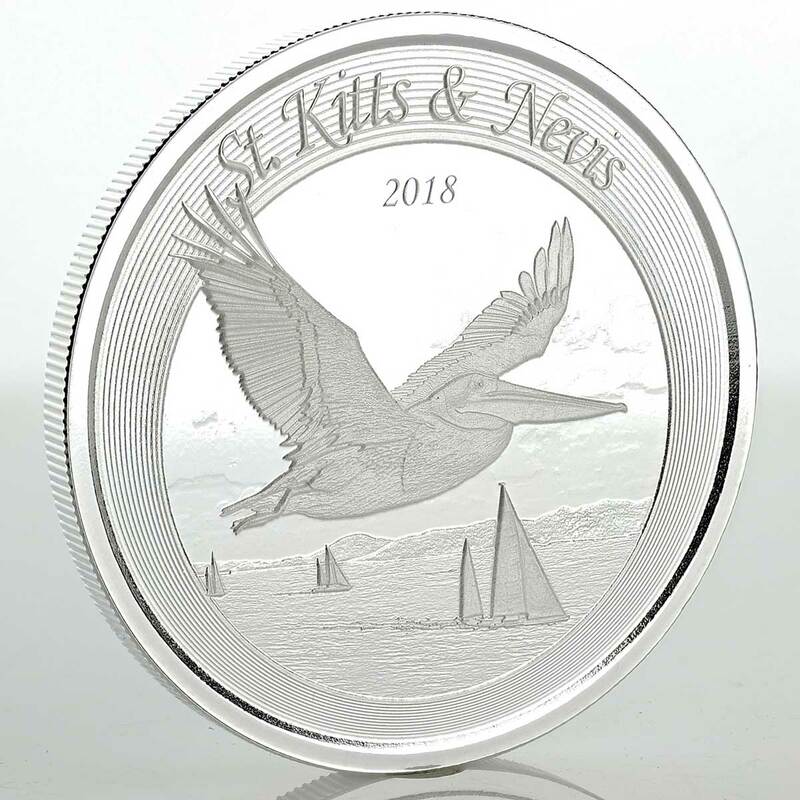 Scottsdale have been issuing some great limited run bullion coins over the last few years, such as the Cayman Islands Marlin and Hokusai, The Great Wave and they’ve now embarked on an eight coin program for release in a single year that will see issues for eight different countries. 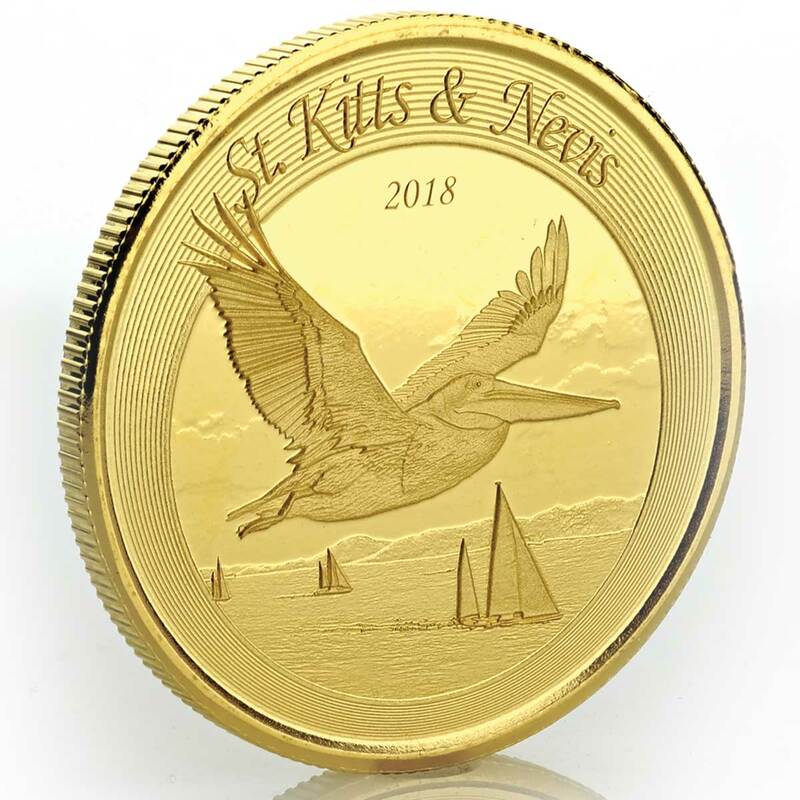 The eight island nations included in the programme are Anguilla, Antigua & Barbuda, Dominica, Grenada, Montserrat, Saint Kitts & Nevis, Saint Lucia, and Saint Vincent & the Grenadines. All of the these small island nations share a currency and a central bank. 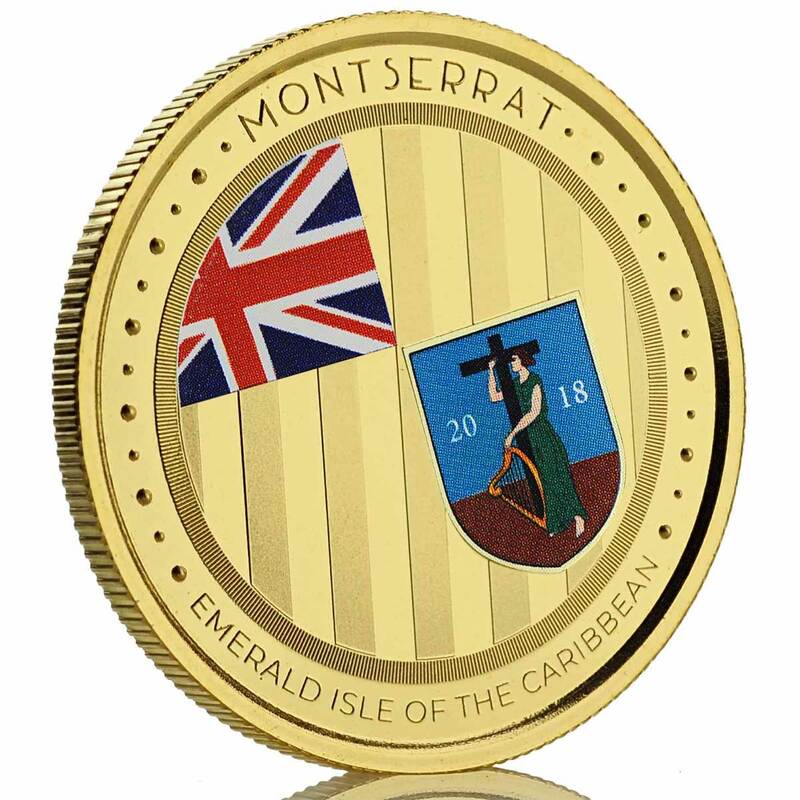 The Eastern Caribbean Central Bank (ECCB) is the official issuer of the Eastern Caribbean Dollar, which is legal tender in the territories of all eight members. 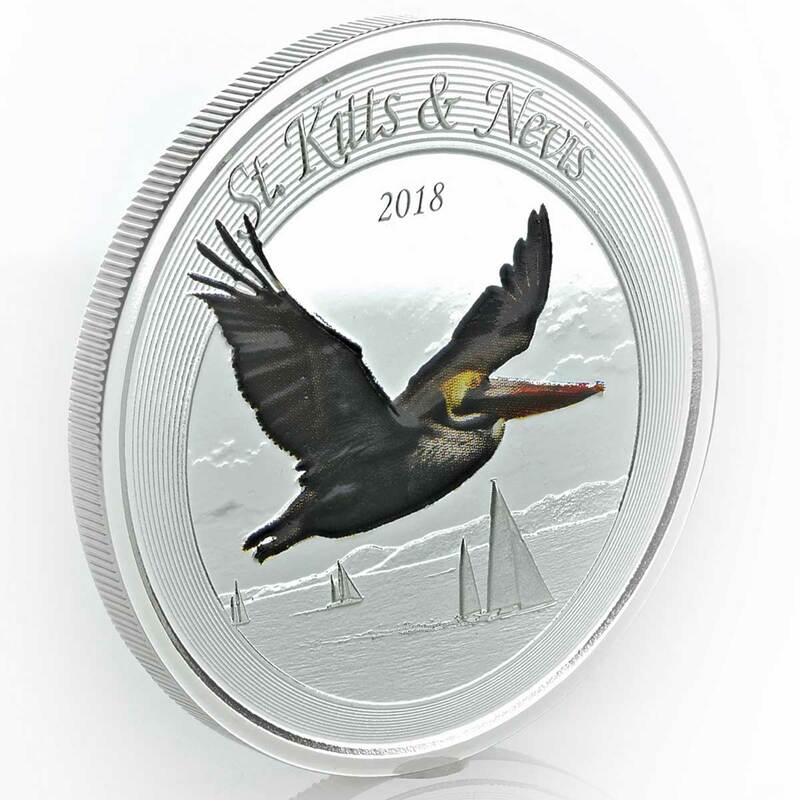 Some of these nations have never had a gold or silver bullion coin issued for them, but Scottsdale will change that with a unique design for each country being released throughout 2018. 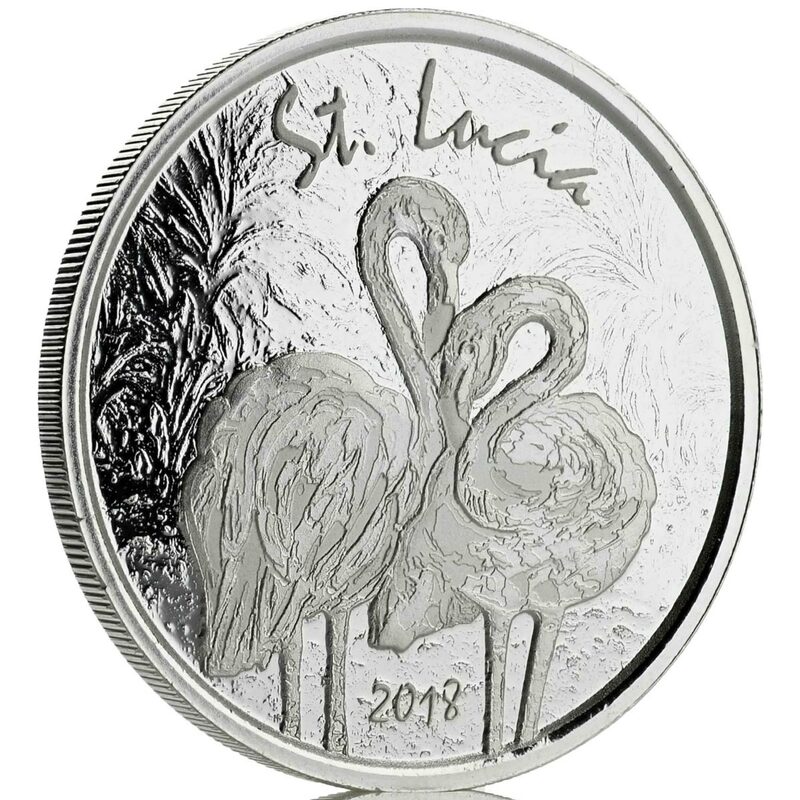 In addition to the bullion coins, there are also proof variants with tighter mintages and a higher quality finish, although priced much higher, of course. 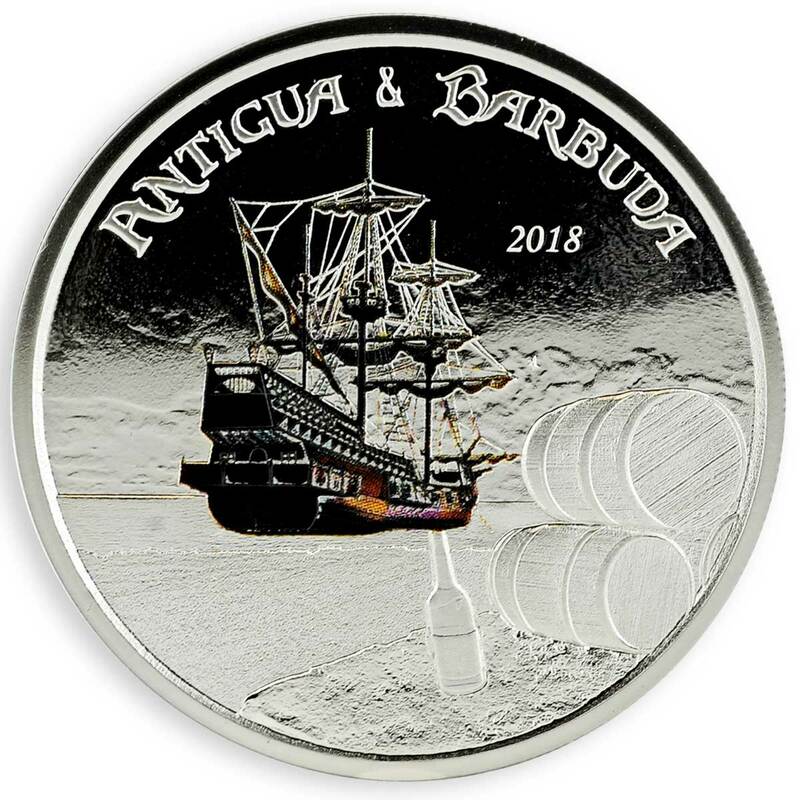 The bullion coin is available as a 1oz 0.999 silver (25,000 mintage) or 1oz 0.9999 gold (2,500) variant, and in addition to those there are a pair of proof commemorative versions with similar weights, but far smaller mintages. 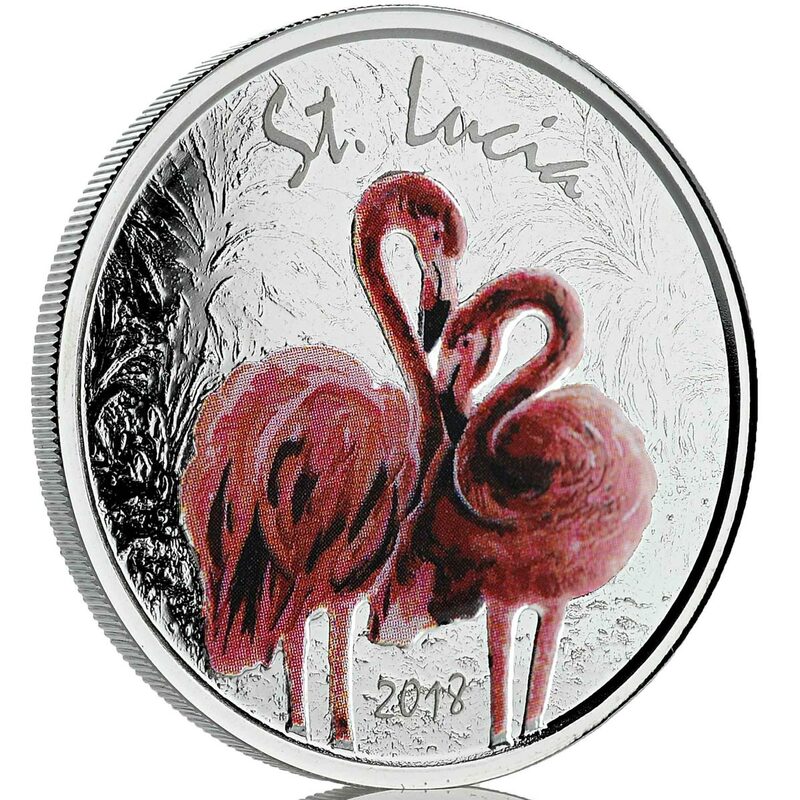 The proof coins have some selective colouring on the reverse face, something we’d prefer wasn’t there, to be honest. 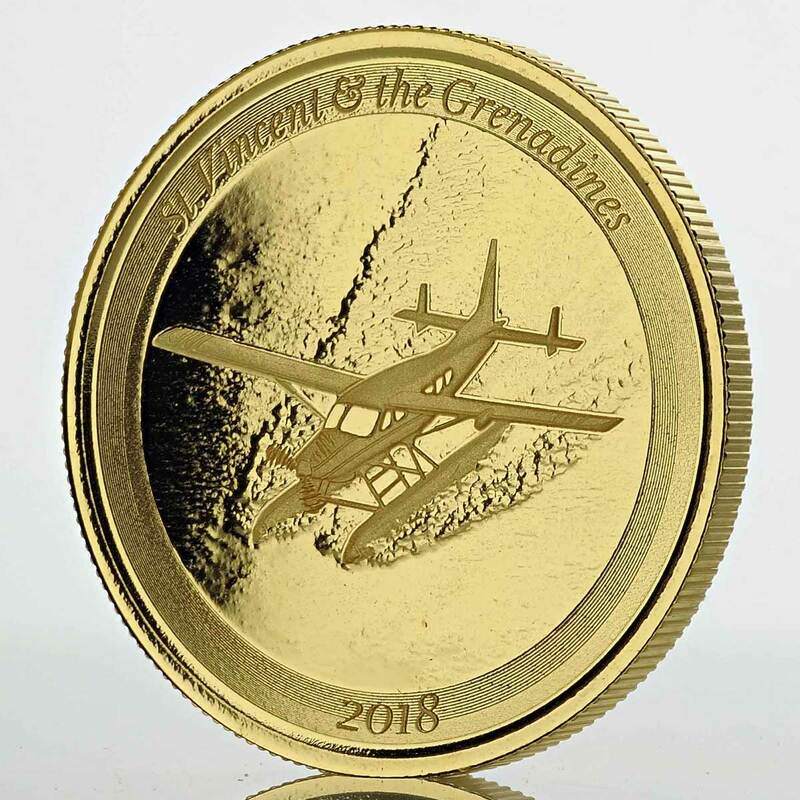 The proof coins will come boxed with a certificate of authenticity. 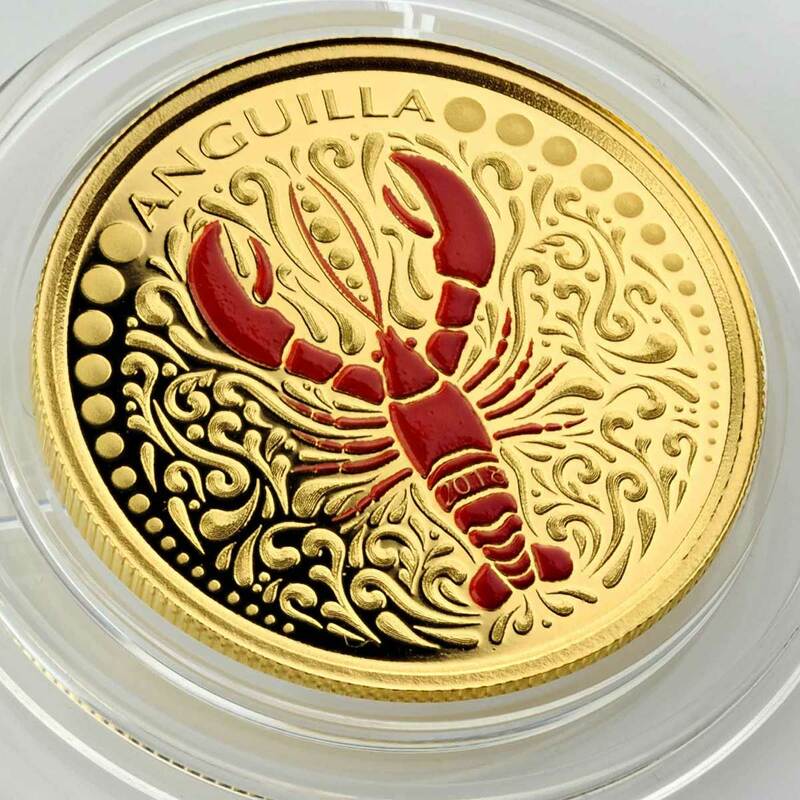 The bullion variants ship in capsules on customized Scottsdale Mint branded skin boards of five, although dealers will sell them individually. 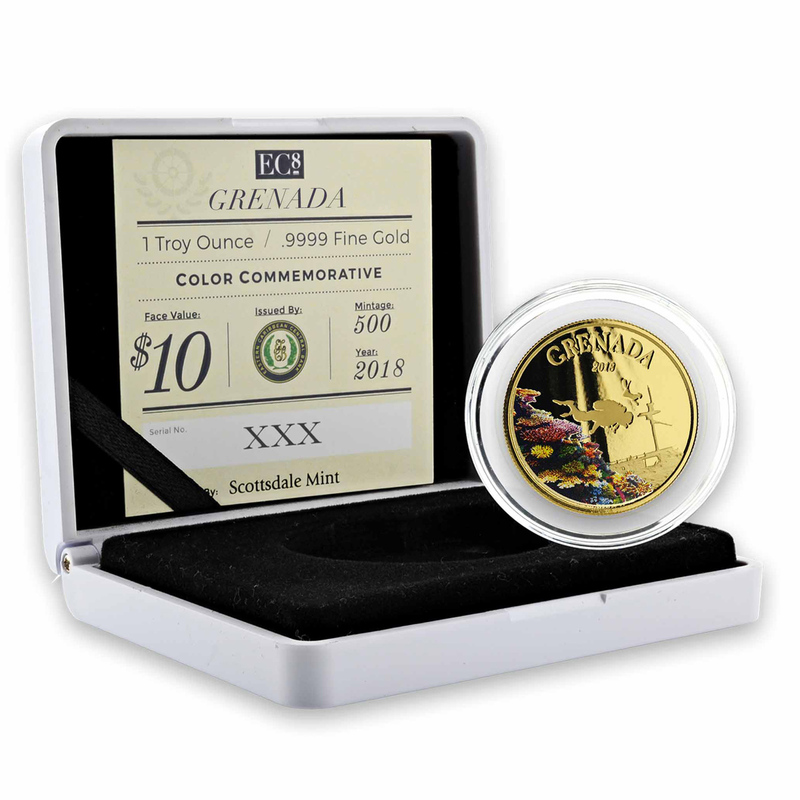 The gold BU coins will ship in Scottsdale Mint’s Certi-Lock® packaging. 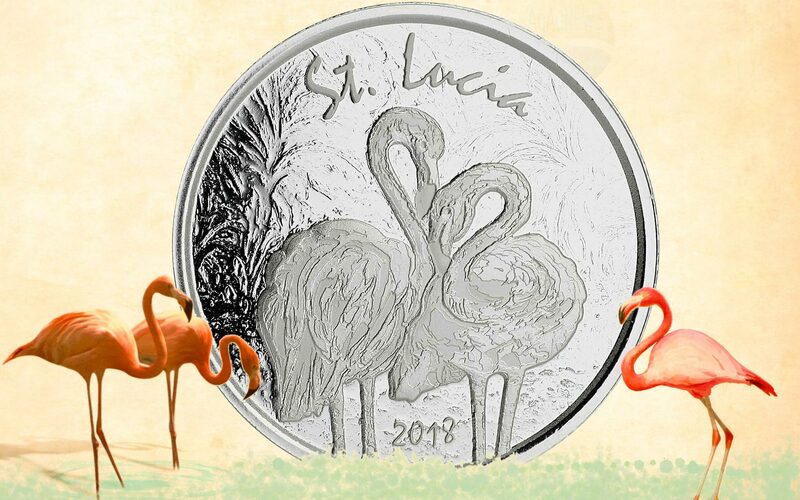 Each design will take imagery associated with the island in question, which given the rich historical and natural history of the region, shouldn’t be a problem. 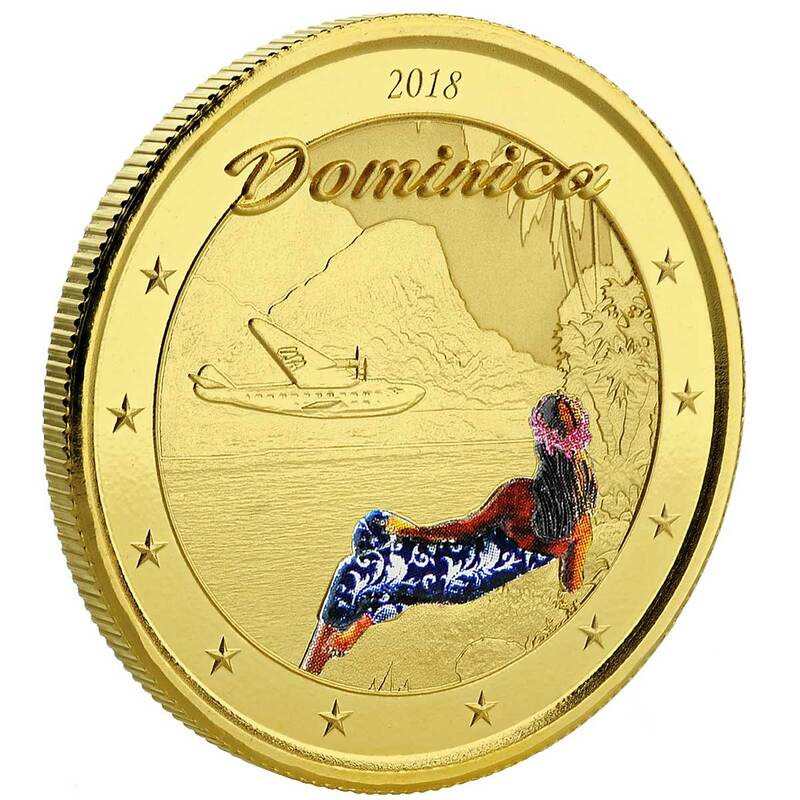 For example, the first coin picks up on Antigua’s rum-running past, and the third the natural beauty of the lush Dominica. When complete, this should be a fine encapsulation of part of one of the world’s most beautiful regions. 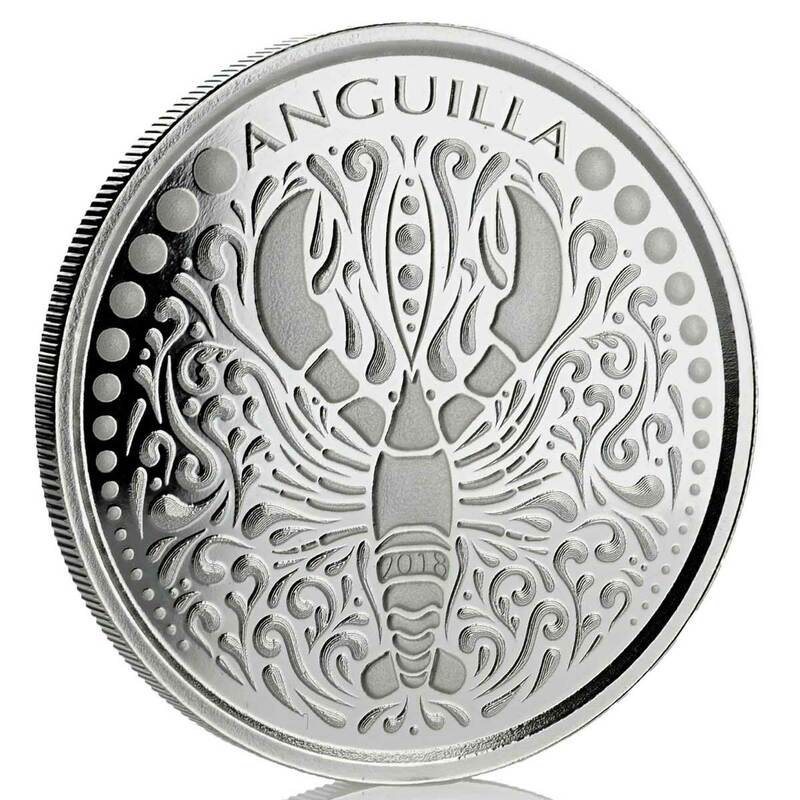 Available from dealers worldwide, although APMEX has an initial exclusive in the US, before wider availability. 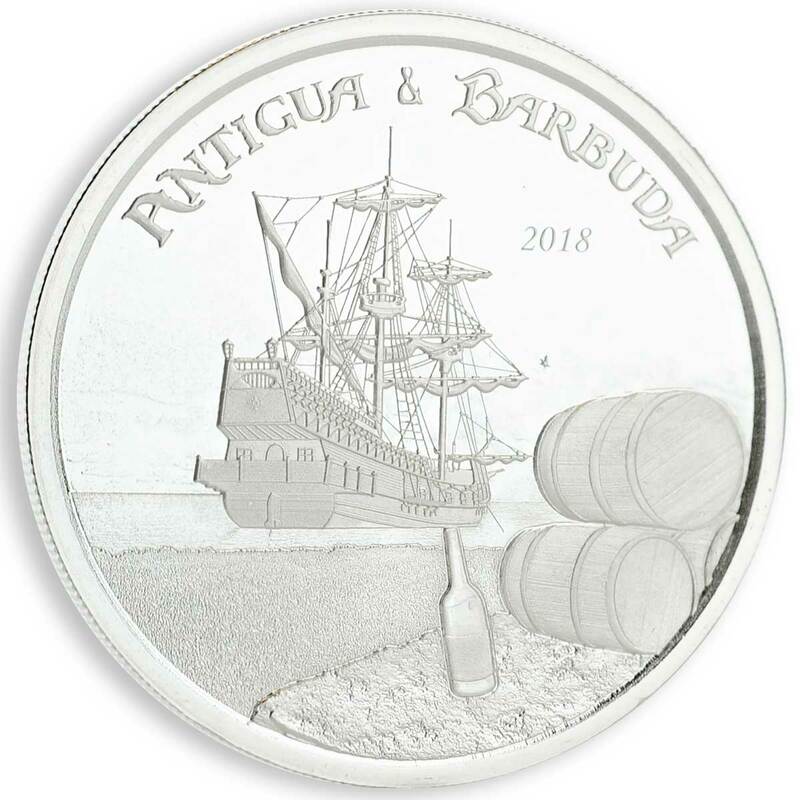 Throughout the Caribbean’s colonial period, competition for rum sales and for the security that armed ships brought with them was fierce among the English Caribbean planters. The Caribbean island governors supported selling rum to the Royal Navy in hopes of the move helping to keep the pirates of the Caribbean at bay. Pirates often made extra money running rum to heavily taxed colonies in North America and the West Indies. As early as the 16th century, the British government employed “Revenue Cutters,” small lightweight vessels to stop the pirates and smugglers. 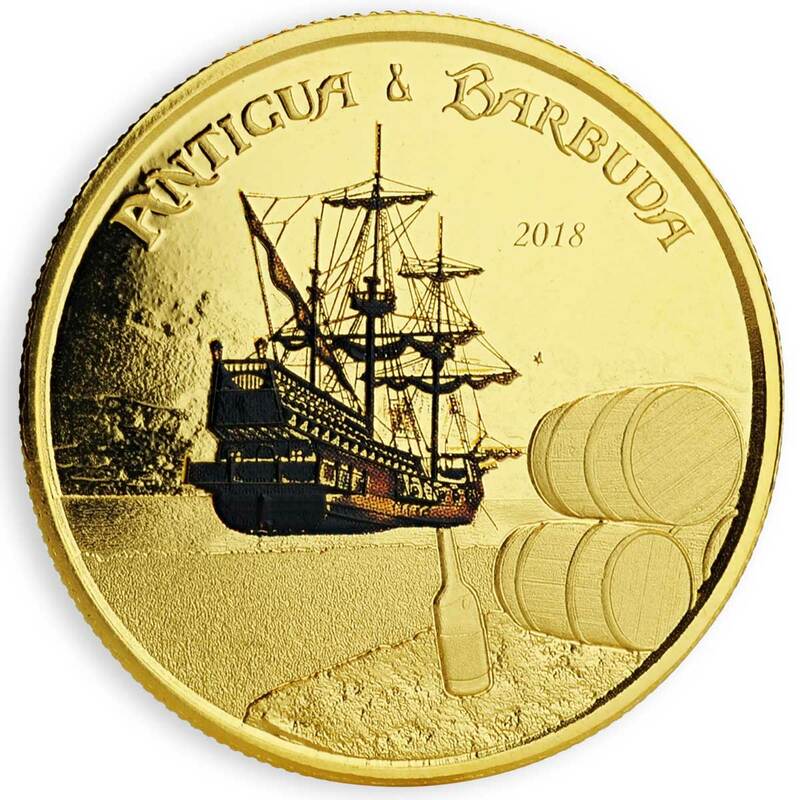 Antigua and Barbuda are two Caribbean islands, (Antigua, pronounced “An-tee’-gah” and Barbuda), that form a country that lies between the Caribbean Sea and the North Atlantic Ocean. Antigua and Barbuda is a Caribbean destination that’s both exotic and luxurious. 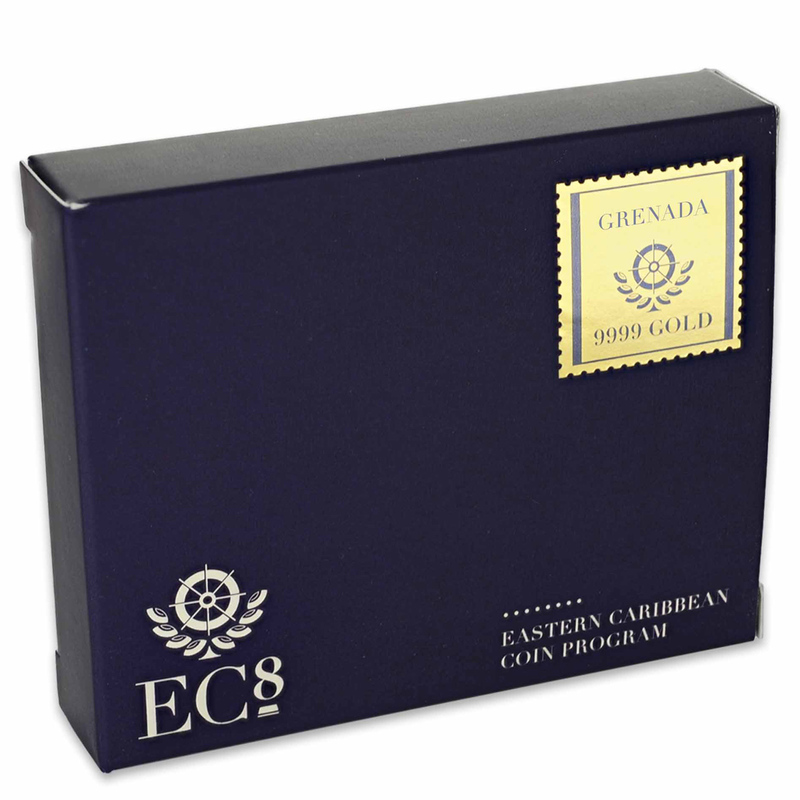 Here you will find a rich history to explore and some of the world’s finest rums. 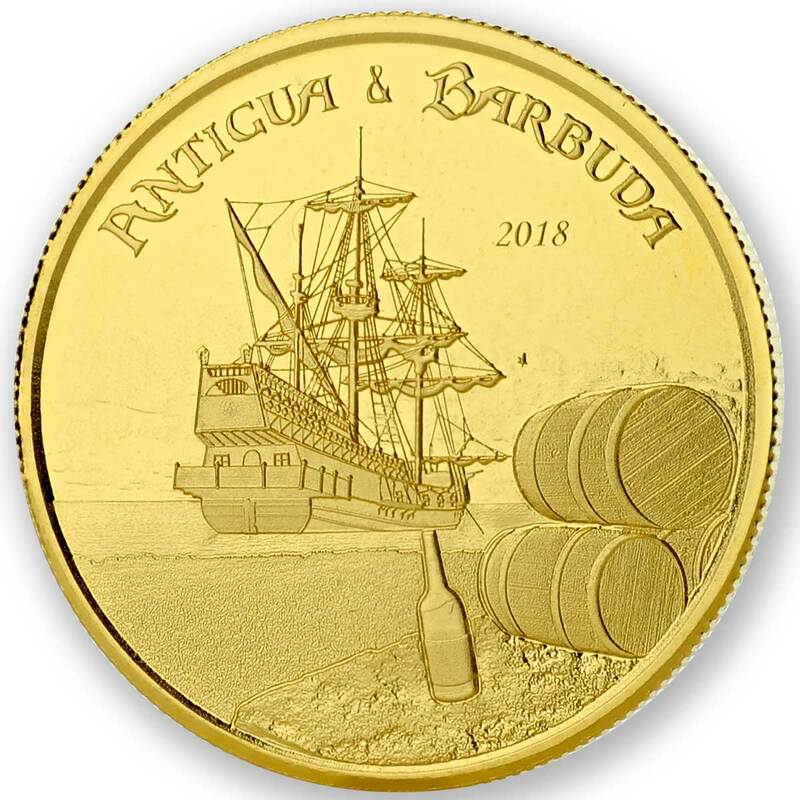 Antigua’s history of rum production dates back to the early 1700’s when sugar was first introduced to the island and quickly became the main crops produced on its plantations. Sugarcane byproducts, such as molasses or honeys, or sugarcane juice, are the primary ingredients in the production of rum by a process of fermentation and distillation. The distillate, a clear liquid, is then aged in oak barrels, thus aiding in the creation of the Caribbean’s world-wide sought after rum. 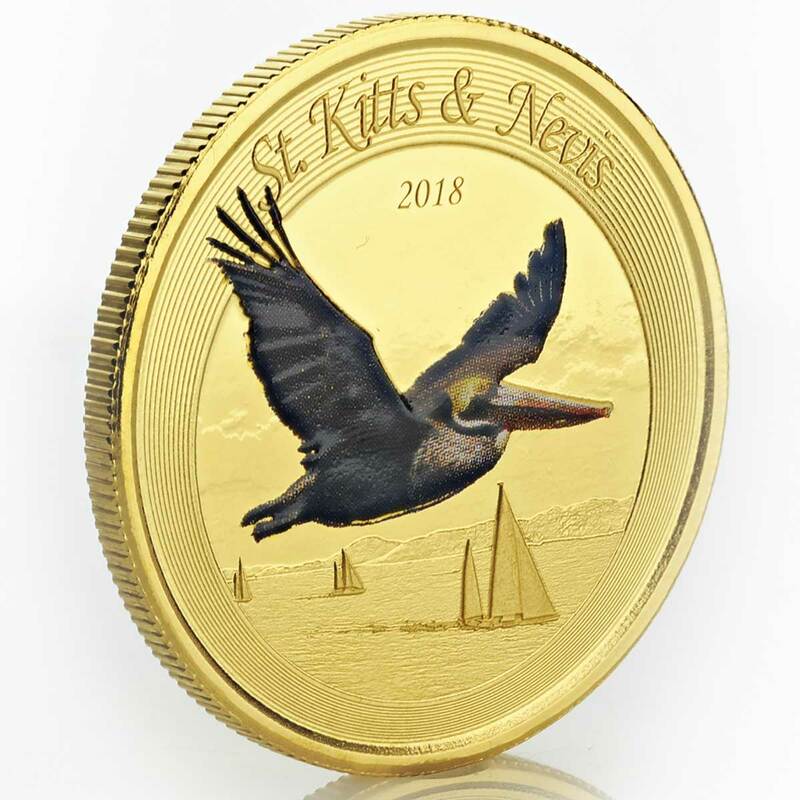 The 2018 ECCB St. Kitts & Nevis coin depicts the national bird, the Brown Pelican, mid-flight in the foreground with sailboats against the island’s silhouette. The Brown Pelican is an elegant bird with an over-sized bill and large body. The national bird feeds by “plunge-diving” from as high as 65 feet, using the force of the impact to stun fish before scooping them into its bill. When young, the Brown Pelican is brown on the head, neck, and upper torso of the body, while white below. As it matures, the body becomes dark brown while the head turns white. 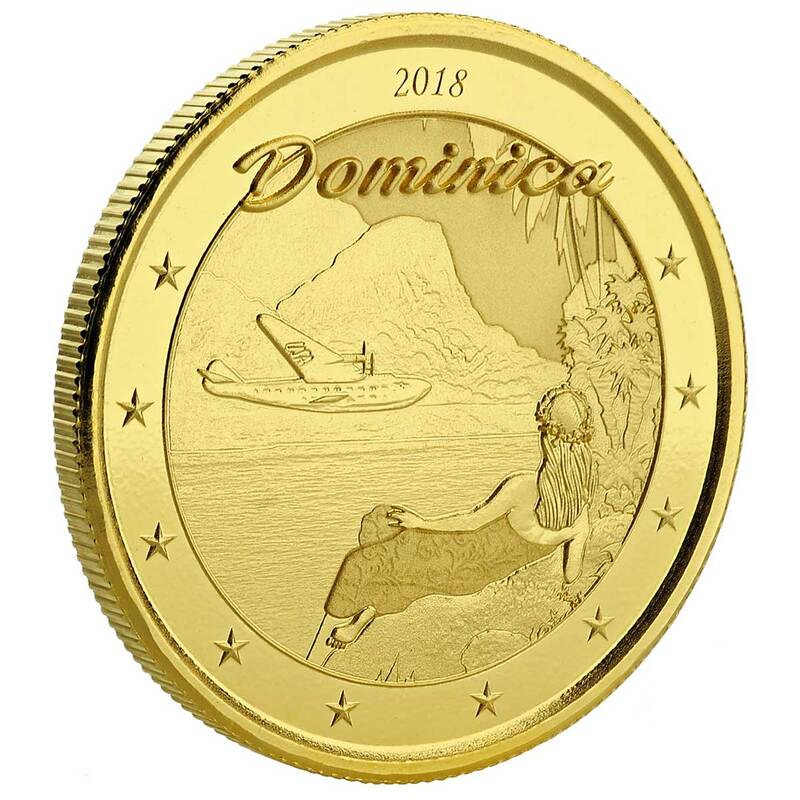 Not to be confused with the far larger Dominican Republic, the Commonwealth of Dominica is an island of approximately 750² km that is part of the Windward Islands in the Lesser Antilles archipelago in the Caribbean Sea. The island is located near Guadeloupe to the northwest and Martinique to the south-southeast. 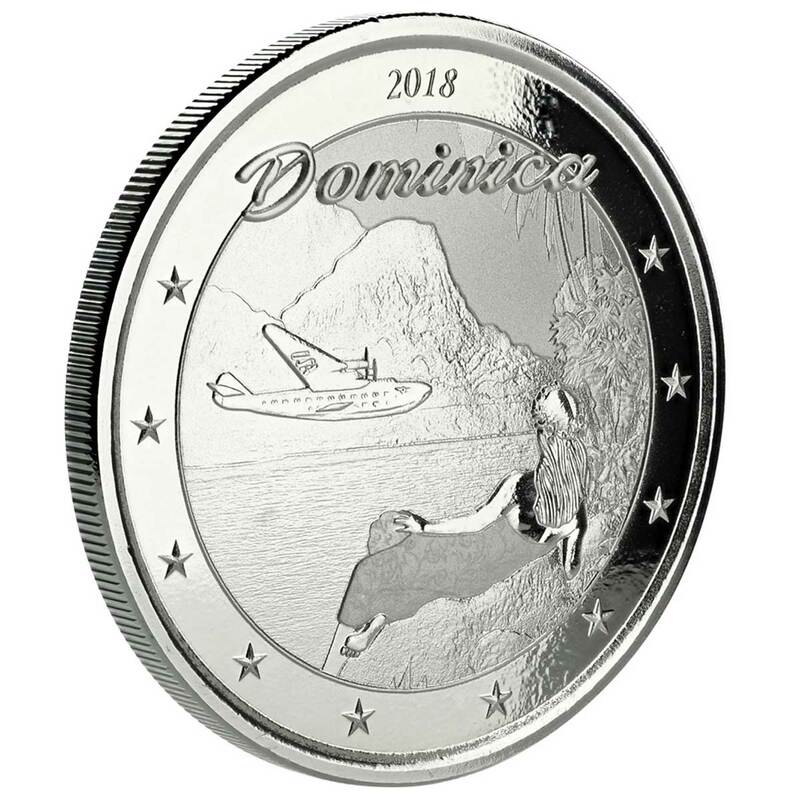 Dominica has been nicknamed the “Nature Isle of the Caribbean” for its natural environment. 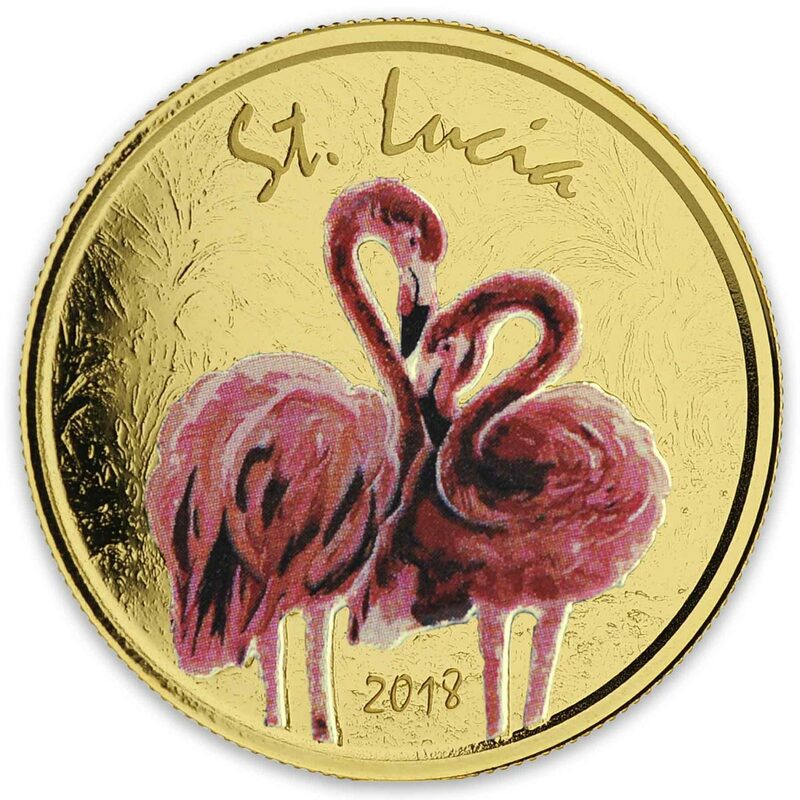 It is the youngest island in the Lesser Antilles, and in fact it is still being formed by geothermal-volcanic activity, as evidenced by the world’s second-largest hot spring, called Boiling Lake. The island has lush mountainous rainforests (highest point is Morne Diablotins, at 1,447 m), and it is the home of many rare plants, animals, and bird species. There are xeric areas in some of the western coastal regions, but heavy rainfall occurs inland. The Sisserou parrot, also known as the imperial amazon and found only on Dominica, is the island’s national bird and featured on the national flag. The island was originally inhabited by the Kalinago and later colonised by Europeans, predominantly by the French from the 1690s to 1763. Columbus is said to have passed the island on Sunday, 3 November 1493, and the island’s name is derived from the Latin for “Sunday”. Great Britain took possession in 1763 after the Seven Years’ War, and it gradually established English as its official language. The island republic gained independence in 1978. The capital, Roseau, is located on the western side of the island and the population was 71,293 at the 2011 census. 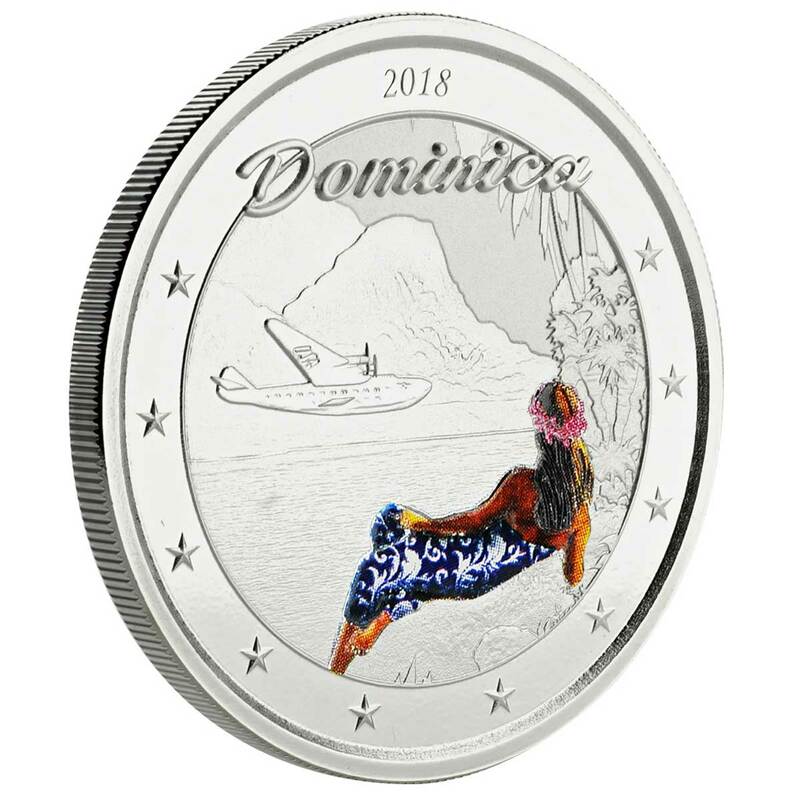 Dominica’s economy depends on tourism and agriculture. 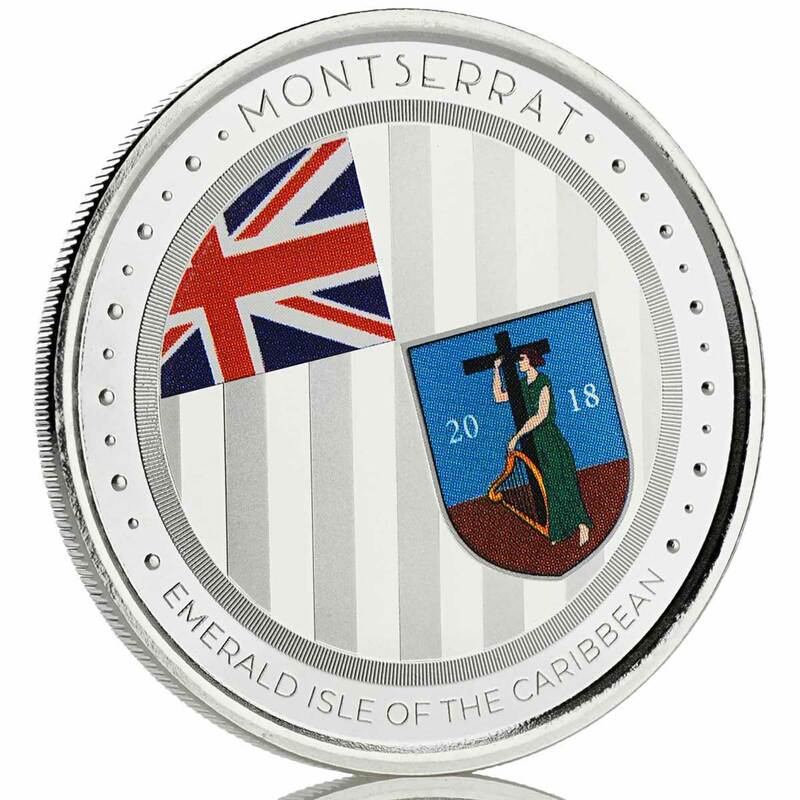 The 2018 ECCB Montserrat coin depicts the Montserratian territorial flag, a blue ensign with the British Union Flag in the canton and the coat of arms of Montserrat. The coat of arms consist of a shield featuring a lady in green representing Erin, the female personification of Ireland holding a golden harp with one arm while embracing the Cross, symbolizing Christianity, in the other arm. 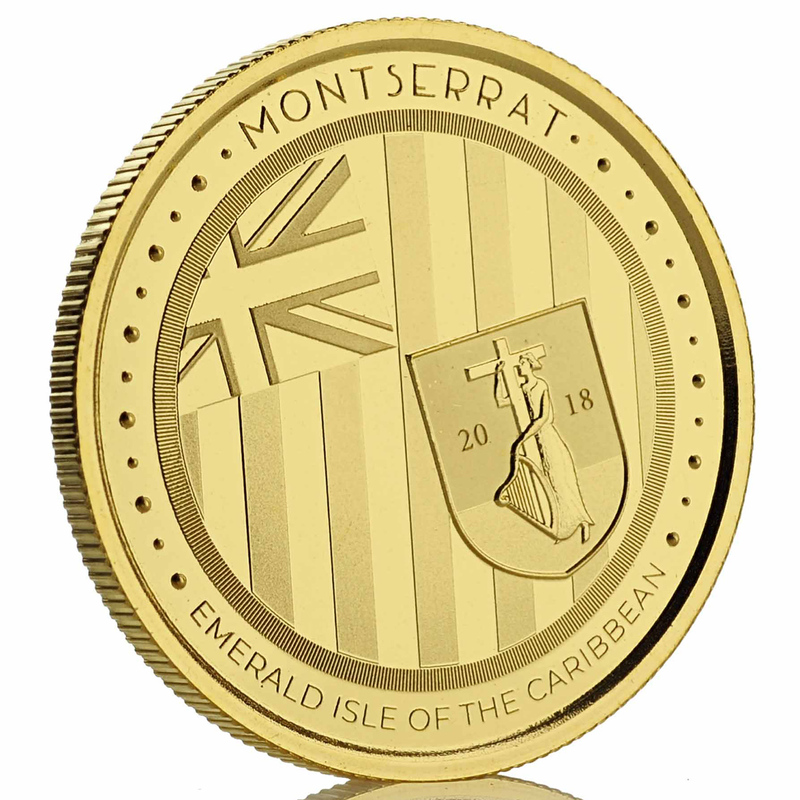 Montserrat is located in the Leeward Islands of the Eastern Caribbean, which is part of the chain known as the Lesser Antilles, in the West Indies. 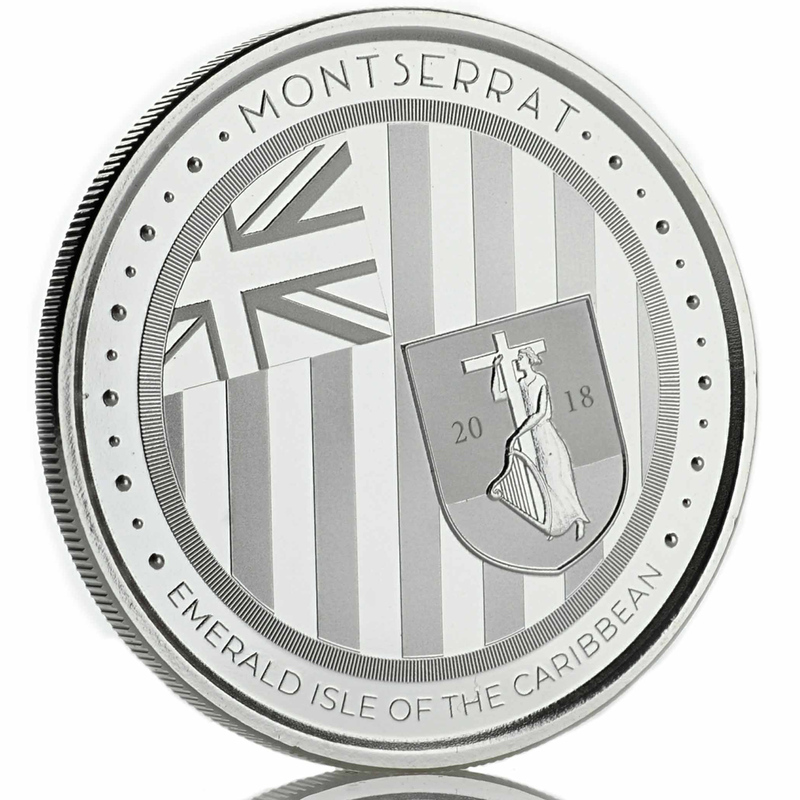 It is a British Overseas Territory whose nickname, “The Emerald Isle of the Caribbean” is derived from its resemblance to coastal Ireland and for its Irish ancestry (prisoners, indentured servants, forced laborers, and loyal opposition soldiery) of many of its inhabitants who began arriving on the island around 1632. 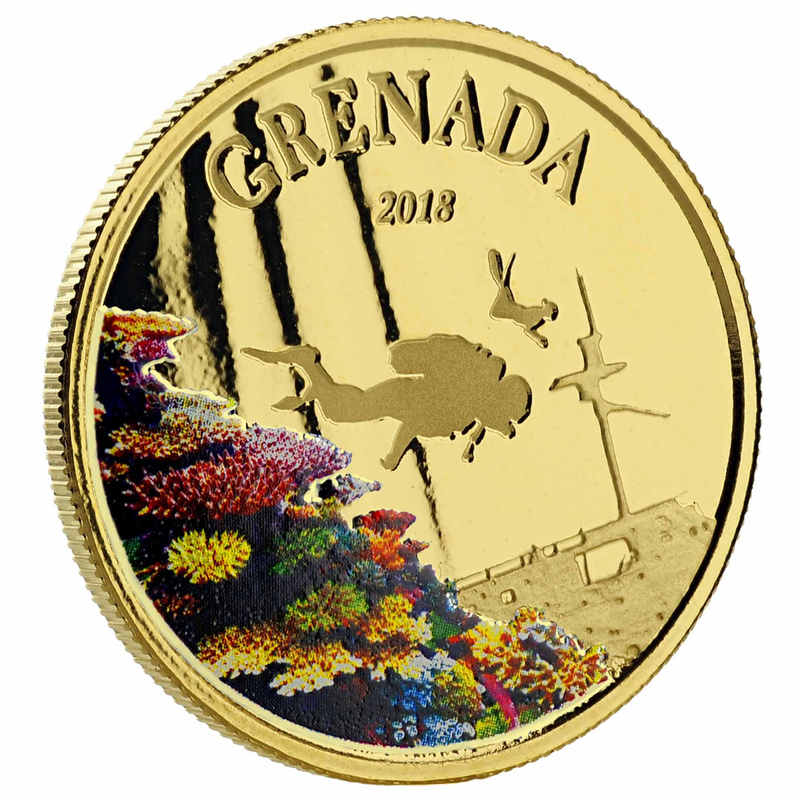 The 2018 ECCB Grenada coin depicts scuba divers exploring beautiful coral reefs and a centuries old shipwreck in the ocean depths off of the coast of Grenada. 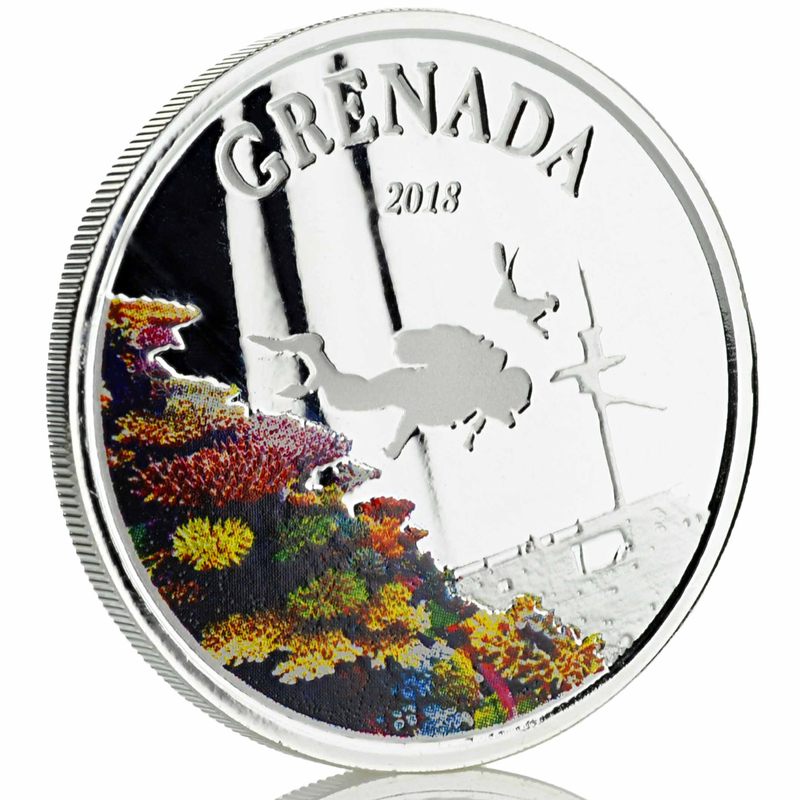 Grenada, known to many around the world as The Spice Isle of the Caribbean, is world renowned for not only its natural beauty, ship wrecks and its spices such as nutmeg but also its spectacular scuba diving. Boasting some of the most gorgeous coral reefs in the Caribbean and a one of a kind underwater sculpture park, Grenada is a scuba diver’s paradise. 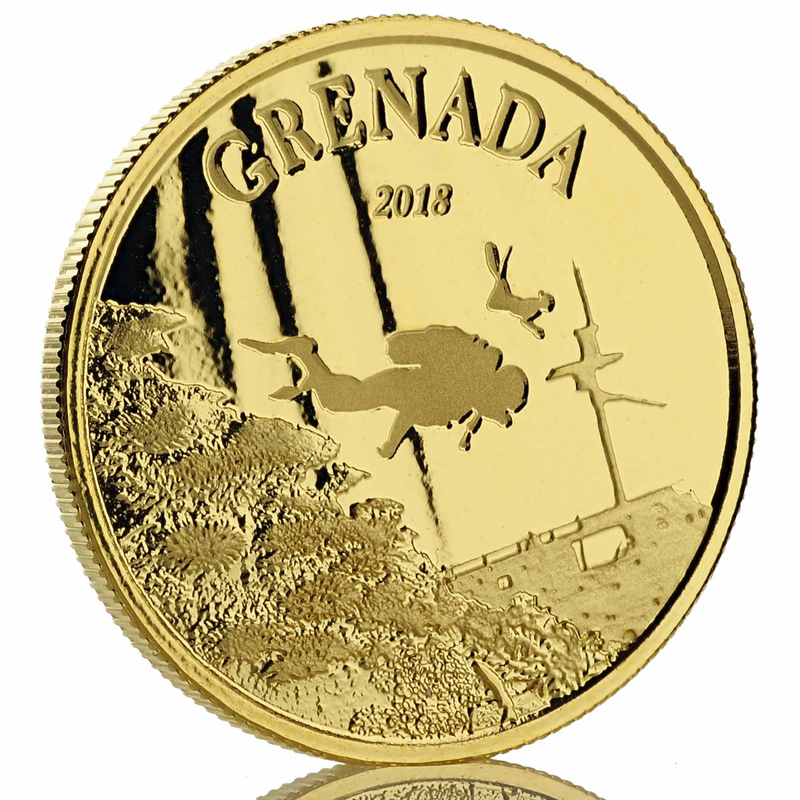 Grenada is a country in the West Indies in the southeastern Caribbean consisting of the island of Grenada and six smaller islands at the southern end of the Grenadines island chain. 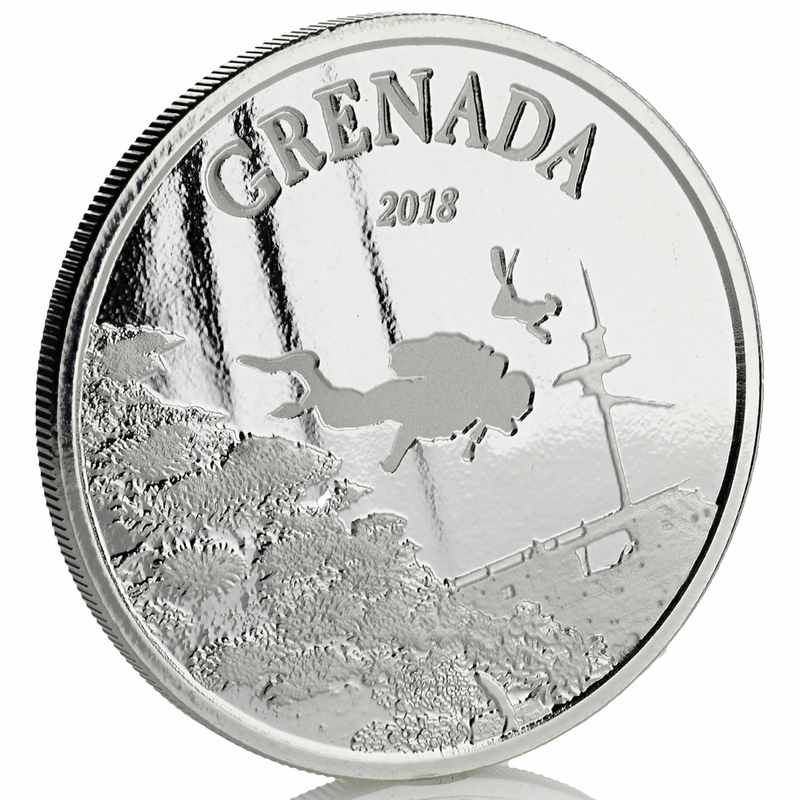 It is located northwest of Trinidad & Tobago, northeast of Venezuela and southwest of St. Vincent and the Grenadines. 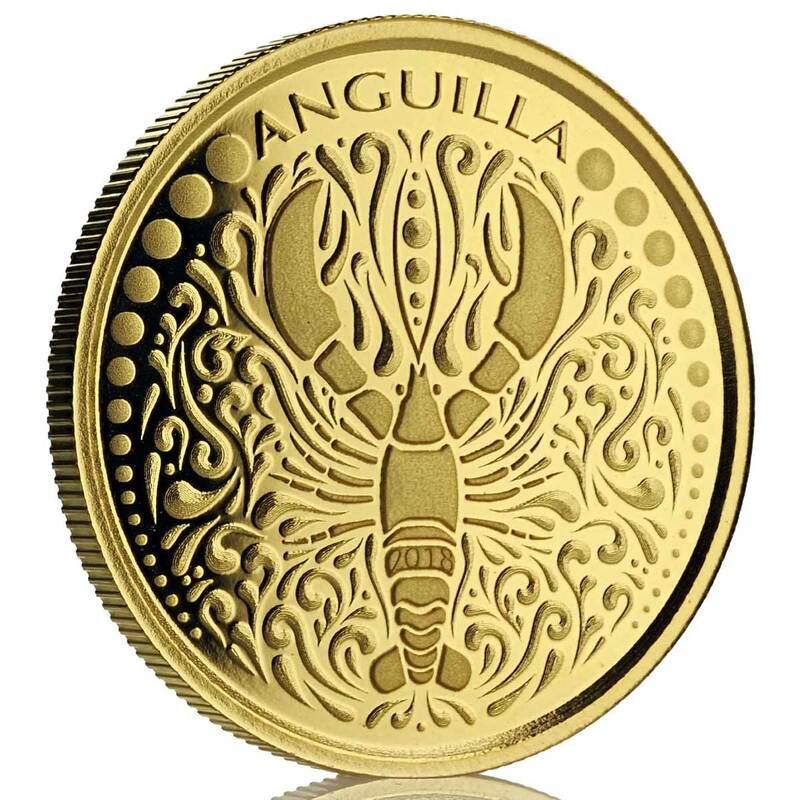 Anguilla is a British overseas territory in the Caribbean. It is one of the most northerly of the Leeward Islands in the Lesser Antilles, lying east of Puerto Rico and the Virgin Islands and directly north of Saint Martin. The territory consists of the main island of Anguilla, approximately 16 miles (26 km) long by 3 miles (4.8 km) wide at its widest point, together with a number of much smaller islands and cays with no permanent population. The island’s capital is The Valley. The total land area of the territory is 35 square miles (91 km2), with a population of approximately 14,764 (2016 estimate). 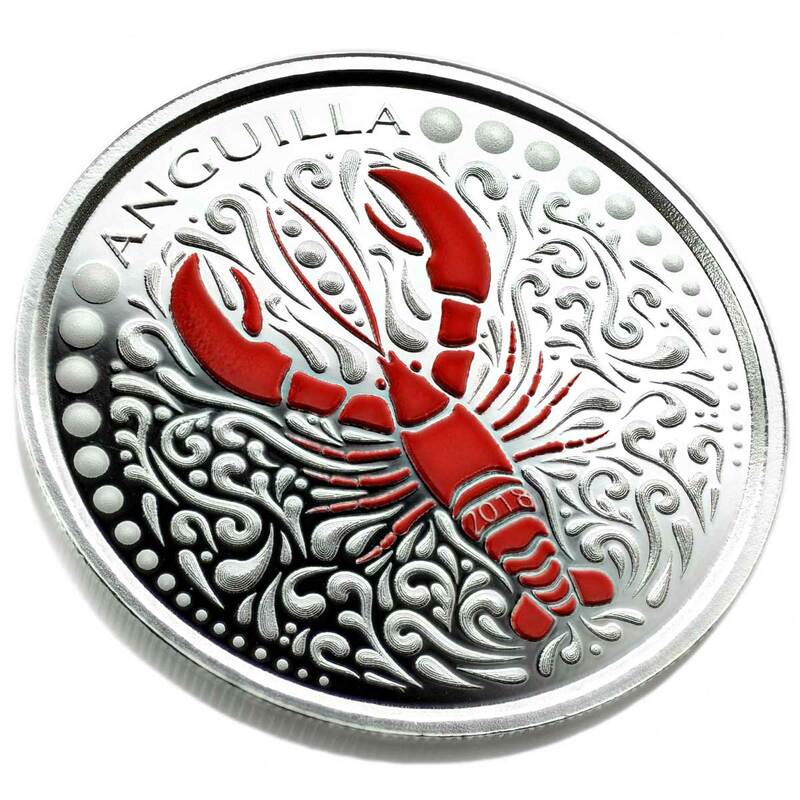 Anguilla is a flat, low-lying island of coral and is noted for its spectacular and ecologically important coral reefs and beaches. Anguilla has habitat for the Cuban tree frogs. The red-footed tortoise is a species of tortoise found here, it somehow came from South America. Hurricanes led to over-water dispersal for the green iguanas to colonise Anguilla. All three animals are introduced. Five species of bats are known in the literature from Anguilla – the threatened insular single leaf bat, the Antillean fruit-eating bat, the Jamaican fruit bat, the Mexican funnel-eared bat, and the velvety free-tailed bat. 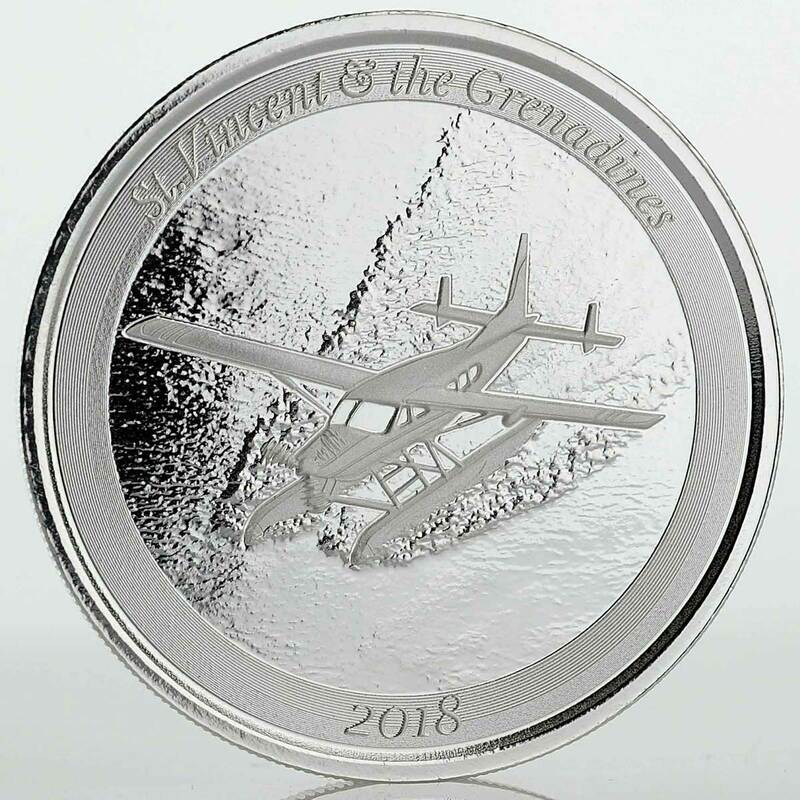 Saint Vincent and the Grenadines is a country in the Lesser Antilles island arc, in the southern portion of the Windward Islands, which lies in the West Indies at the southern end of the eastern border of the Caribbean Sea where the latter meets the Atlantic Ocean. The sovereign state is also frequently known simply as Saint Vincent. Its 389 km² territory consists of the main island of Saint Vincent and the northern two-thirds of the Grenadines, which are a chain of smaller islands stretching south from Saint Vincent Island to Grenada. Most of Saint Vincent and the Grenadines lies within the Hurricane Alley. 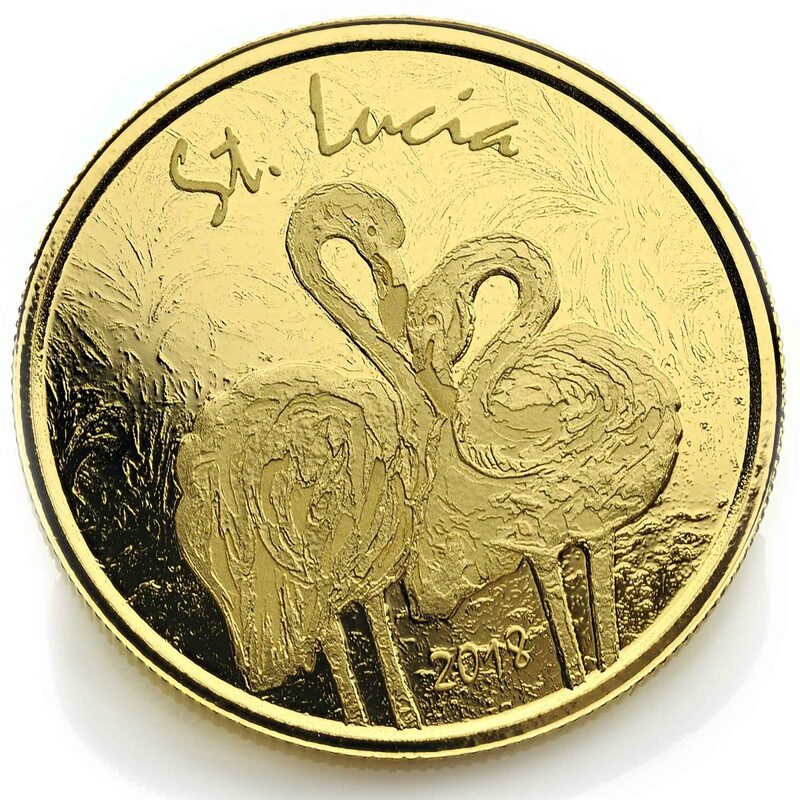 To the north of Saint Vincent lies Saint Lucia and to the east is Barbados. 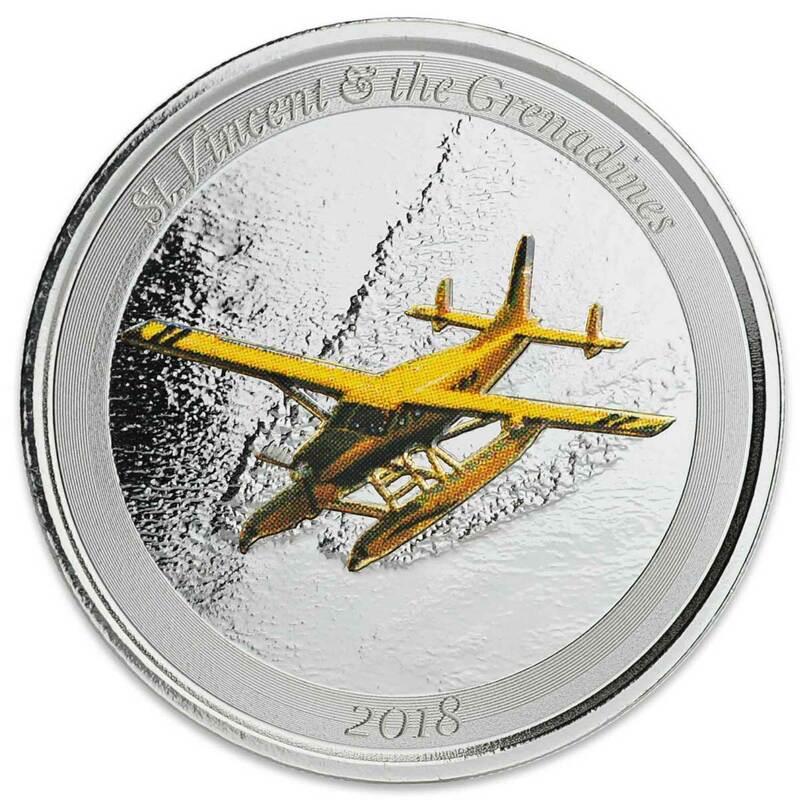 Saint Vincent and the Grenadines is a densely populated country for its size (over 300 inhabitants/km2) with approximately 109,643 inhabitants. Kingstown is the capital and main port. 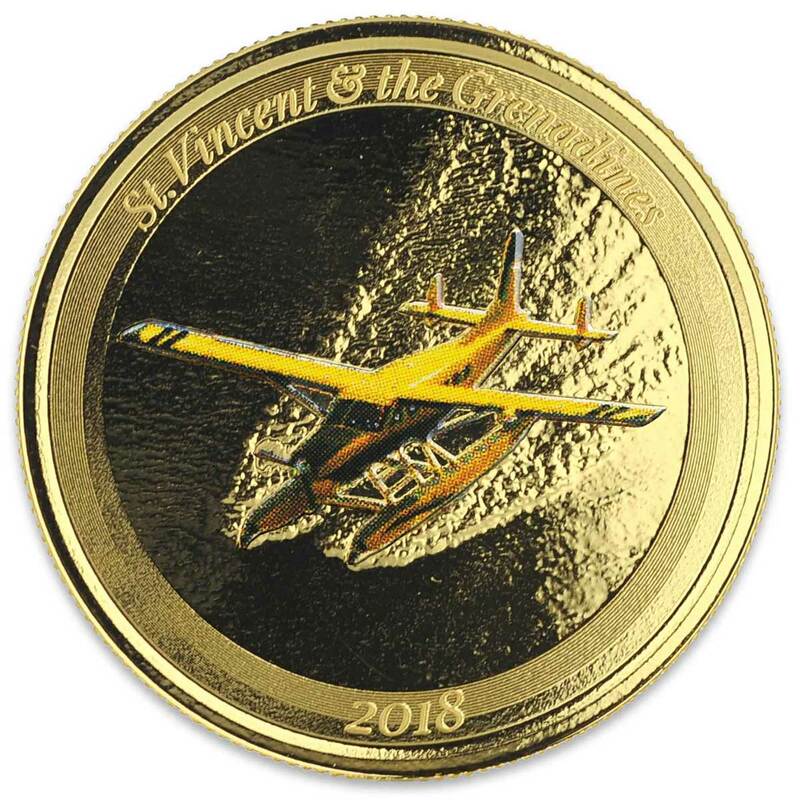 Saint Vincent has a French and British colonial history, and is now part of the Organisation of Eastern Caribbean States, CARICOM, the Commonwealth of Nations, the Bolivarian Alliance for the Americas and the Community of Latin American and Caribbean States (CELAC). 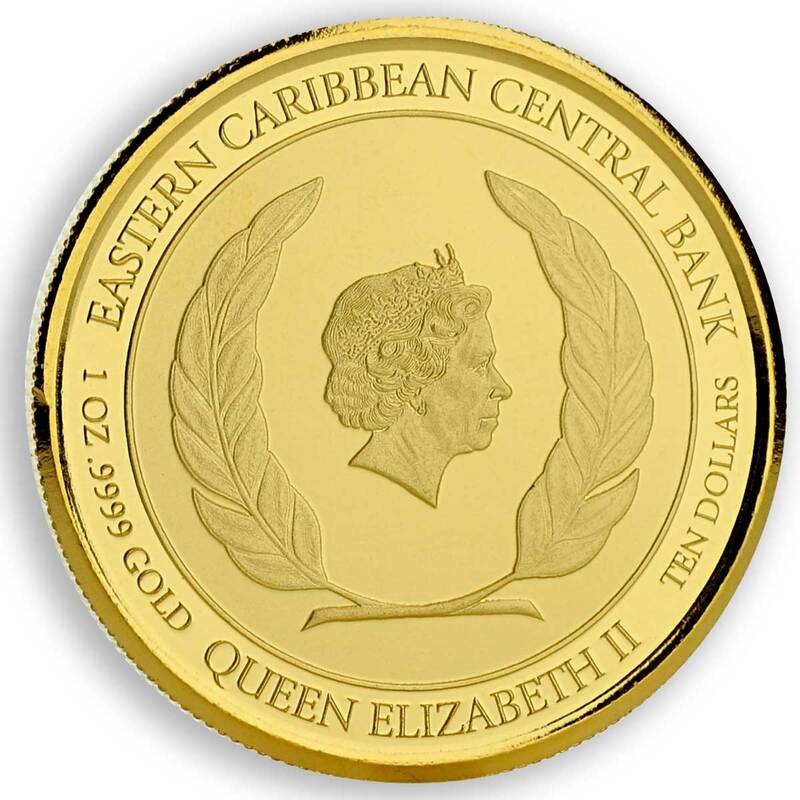 The obverse is common to all eight coins as each is issued via the Eastern Caribbean Bank, and remains the same for gold and silver. The border carries inscriptions detailing the issuer, the composition, and the denomination. 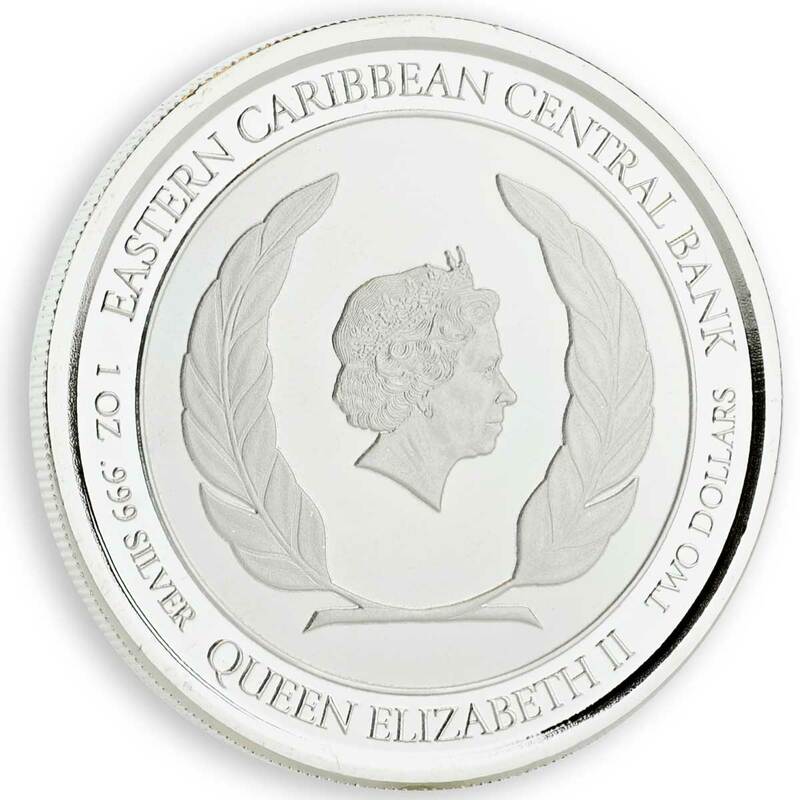 The centre section features the Ian Rank Broadley effigy of Queen Elizabeth II inside a pair of leaves (olive or laurel? ).